I only keep a few knives up and rotate them. Generally there are only three or four knives up. 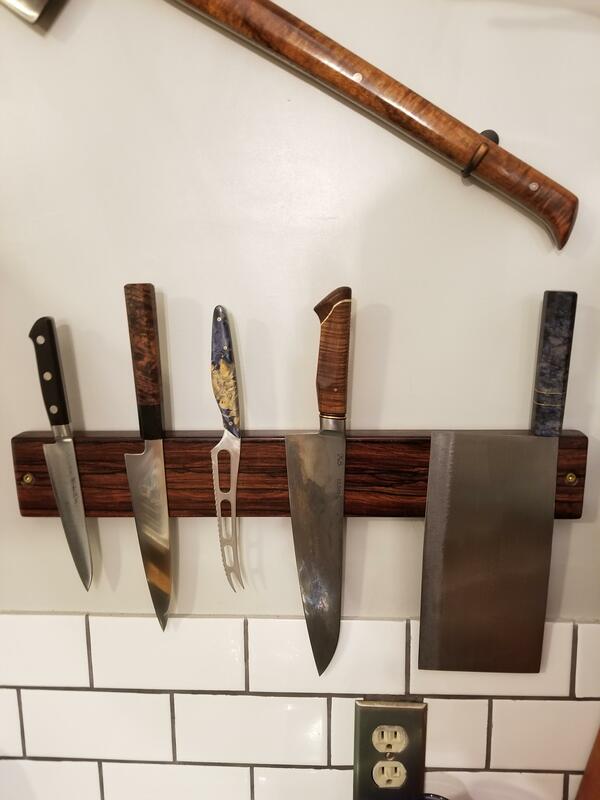 A petty, chef, slicer and something stainless. This is from JKI, cocobolo. Magnet placement is phenomenal (surprisingly difficult to do), no moving or sliding knives. What’s the story on the axe? Nice looking handle! Lol, no axe, just a 24 inch splitter...just can't seem to find a need for it. So it acts as visual appeal...and scaring guests. I love it. I have 3 x 22 inch bars. Wow Drewski! Six feet of knife rack?! And Elm too. Nice. WE grew up w elms all the way down the street. Oh, and is that a Pioneer speaker in the second shot? CS-44? Had a pair of those around 1970! Pretty cool! Let's see those 22' bars Ben! Great eye on the loudspeakers, but these are CS-77, 3-ways. Picked them up around 8 years ago. Really efficient speakers and can't ask for a better sound in the spaces I've lived. Last edited by Drewski on Thu Apr 18, 2019 8:17 am, edited 1 time in total. That's the biggest rack I have ever seen. We're still waiting. But seriously, thanks all for the comments. Really happy with how this looks.